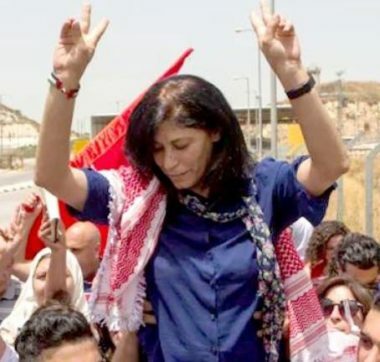 56 year old Palestinian, and member of the Palestinian Legislative Council, Khalida Jarrar, was released from Israeli prison Thursday, after twenty months of administrative detention, WAFA reported. Jarrar was released at the Salem military checkpoint, near the Northern West Bank city of Jenin, hours earlier than announced. Arrested from her home in Ramallah, on July 2, 2017, for her involvement in the Popular Front for the Liberation of Palestine (PFLP). Jarrar’s sentence was continually extended by the Israeli military court. The human rights and prisoners’ rights advocate was also detained in 1989, and 2015, and her movement out of the West Bank has been restricted since 1998. 495 Palestinians continue to be detained by Israel, under administrative detention, which WAFA says is “a procedure that allows the military to hold prisoners indefinitely on secret information without charging them or allowing them to stand trial”. Dr. Hanan Ashrawi commented on Israel’s use of administrative detention, WAFA reports, calling it a “tool of cruel punishment and oppression that the Israeli occupation regime has employed against thousands of Palestinian activists throughout the past fifty-two years”.